This news is almost a month old but I wanted to share it via my blog. I admit to being a Second Life (SL) novice and having very little experience in virtual worlds. However 3 weeks ago I had the opportunity to have 2 virtual world experiences very close together! The first was the NetGen Ed Awards for 2009, and I have already blogged about this, 'Virtually Awarded....and More!' 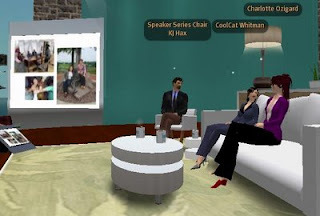 The second was when Vicki Davis and I were interviewed in Second Life by Kevin Jarrett for the ISTE Eduverse series. Our show with Eduverse was called 'Flat Classrooms: using We 2.0 Tools to level the playing field between students and teachers'. The MP4 file, that runs for about 50 min., is available on the website as well as further information. This show was a liberating experience in SL, and despite it being at 3am in the morning Doha time (I am not joking!) I am delighted to have had the opportunity to be a part of it. It was a little disconcerting trying to face the person I was speaking to, and look remotely intelligent sitting up there on the couch. My new avatar, Charlotte Ozigard had some coaching with dress and grooming, but I think CoolCat Whitman and KJ Hax looked a lot smarter in appearance. I'll have to work on this for the future. The interview was expertly staged by KJ and Vicki and I had lots of opportunity to talk about the flat classroom projects and the conference held here in Doha in January. This virtual medium has a LOT of potential I think, and once initial concerns about appearance and how to move are eleviated, it is a lot of fun. I encourage readers to watch other episodes in the ISTE Eduverse series that include colleagues such as David Warlick, Peggy Sheehy, Joyce Valenza, Chris Flesuras, Steve Dembo and more! Soooo cool, Julie! Keep up the great work!